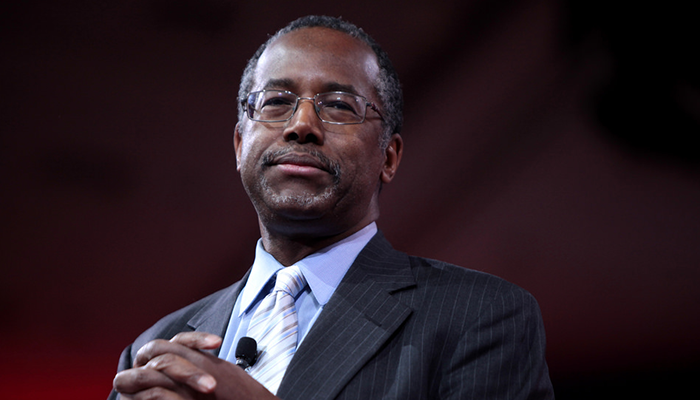 The latest dust-up over the mention of religion in the public square involves Housing and Urban Development Secretary Ben Carson, whose big crime is attending a Bible study with other members of President Trump's cabinet. The Freedom from Religion Foundation (FFRF), whose feathers are ruffled over this, is purportedly concerned about staffers being "coerced" into the Bible study, or public funds being spent on it. Secretary Carson got that out of the way up front, writing on his Facebook page: "First of all, taxpayer funds are not used to support the ministry, . . . And secondly, no staff are involved in the Bible study." He continued: "I refuse to be intimidated by anti-religious groups into relinquishing my spirituality or religious beliefs [...] One of the principles of our nation's founding is freedom of religion. I will not stop being a Christian while in service to this country [...] In fact, it is my faith that helps me serve the nation even better." Secretary Carson also drew a lesson from the history of the Cold War between the U.S. and former Soviet Union: "Joseph Stalin, the Russian tyrant who said the United States could be destroyed from within by eroding three things: our patriotism, our morality, and our spirituality [...] These things are currently under severe attack. We the people must decide who we are and what we stand for." Amen. Ralph Drollinger, who leads the Bible study with cabinet members, responded to the suit by stating: "Rather than sue, the FFRF can simply go to www.capmin.org and check out copies of the Bible studies I write and teach the Cabinet, Senate and House Members every week." Another amen. But I suspect access to Bible study materials is not exactly why FFRF filed a FOIA request (and sued when HUD declined to waive the normal fees that apply to a FOIA request). Apparently, FFRF, along with Citizens for Responsibility and Ethics in Washington (CREW), have also filed FOIA requests seeking information about the amount of time Secretary Carson's wife and son spend with him while he's working. Aside from wasting everyone's time, this request smells like an attempt to needlessly distract and bog down the normal functioning of government. But the larger issue and more important issue at play here is that some people and groups simply can't stand the idea of a visible Christian presence in our country. They oppose any public display of Christianity or prayer, offering various attempts to legally justify their opposition, most often that such displays "establish" a religion (they don't). Their ultimate goal is to either drive Christians from government or at minimum force them to hide their faith so that the net result is the same -- government devoid of godly men and women. Think about that for a moment. Do we not pray for godly government? Doesn't Scripture say that people rejoice when the godly rule? That happens when godly men and women serve in government -- not in spite of their faith -- but because of their faith.